Helltrip is an intensely claustrophobic, confusing experience, best displayed in its opening sequence. The first bit is very clever, actually. You do indeed wake up on the floor, and the way things are organized, you may actually struggle to get up. From here you're going to spend a lot of time searching corridors that open up bit by bit. 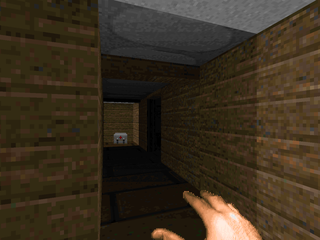 (The comparison to Doom II's "Tenements" is quite apt.) Eventually, you're going to bump into something. Without finding any secrets, it will be a baron, which is quite the surprise, seeing as you only have a pistol. Any Doomer worth his or her salt won't find it very intimidating, though. Playing through Congestion 1024 taught me what I can sidestep, and Root has left enough space to dance past the baron's plasma bolts until you can eventually find an armament. So, you're looking at a cramped maze. Not very scary, though there's one point where half the total monsters fill the halls up (not sure whether you can avoid this). You'll eventually clue in to lindefs that trigger lifts leading to secret cubbies, and eventually an open-air encounter with a Spiderdemon. Not to worry, though. Adequate cover springs up before you and you can take your time finding the blue key, and of course, the wily BFG. At some point, however, you'll run into the true terror of this WAD. At several points Root unleashes arch-viles into your slice of Hell and your heart starts to race as you realize all your hard work is being undone. Even worse if one of them manages to revive a baron and use it for a meat shield as they pad their way toward your misbegotten person. And you with nary more than a shotgun, usually. If you manage to wipe the sorcerers out, you'll eventually hit upon the the other huge snag, after a room whose floor collapses and rises in whole chunks. 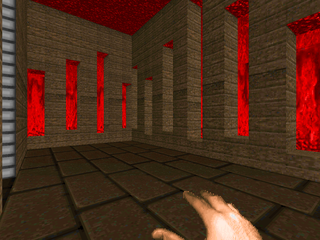 You'll wake up a Cyberdemon who teleports away. Of course, there are only two feasible locations he could turn up at, and (surprise) it's the less spacious of the two. Things start to go a little weird around here, with features like a door that constantly opens and closes with no visible trigger, as well as a series of archways that open the maze up for the player but cause enemies that walk through them to warp around. 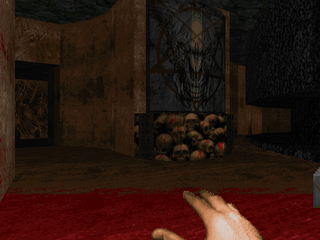 Eventually, after blasting the final arch-vile apart, you use the red key and make your way to the end sequence, which is comparatively quite banal next to the ordeal you just endured. I'd say that Helltrip succeeds in establishing an atmosphere of paranoia, with its teleports and linedef tricks giving the player plenty of red herrings so that the real threats are often met without proper care. There are some neat special effects, namely the repeatedly opening / closing door and the fire-window annex where lost souls appear to surface from the embers ever so briefly. On the whole, though, it's more annoying than astonishing, offering little visual appeal. The real show is how Hellbent violates your sense of safety in a genre where we take a particular style of map progression for granted. I'm used to teleport traps and monster closets and even arch-viles starting trouble in previously cleared areas, but never in a setting as intimate as this.